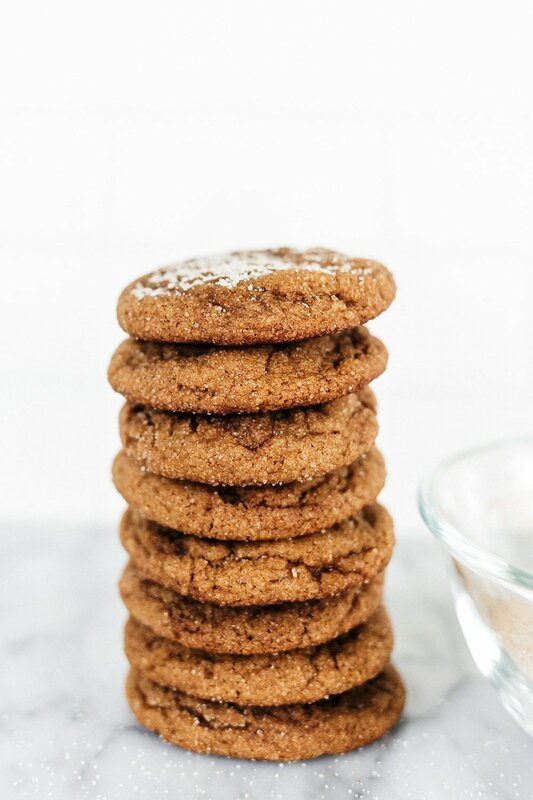 The perfect combination of snickerdoodle and gingersnap, these Gingerdoodle cookies are puffy and soft and filled with warm spices. 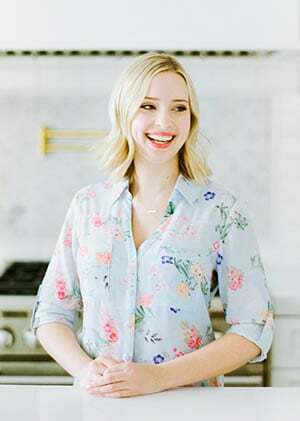 Cookie baking make-ahead and storage tips included below. It wouldn’t be December without dozens of cookies. We all have our family favorites that become holiday traditions, but this year I’m adding one to the mix that’s the best of both worlds. These Gingerdoodle cookies are the perfect taste and texture mash-up of puffy soft snickerdoodles and richly spiced gingersnaps. I think they might even become one of your holiday baking traditions! I literally took my favorite snickerdoodle recipe and my favorite gingersnap recipe and combined them. The first batch ended up too flat and crisp for my liking. That was because they contained more baking soda, which can promote spread and browning. So, for the second batch, I reduced the baking soda and increased the cream of tartar. The resulting cookies had that characteristic soft snickerdoodle texture with all that gingersnap flavor I love. Perfect! I’m actually teaming up with OXO to bring you this cookie recipe. You all know by now that my love for their Cookie Scoops is endless. I use them every single time I make cookies, which is embarrassingly often. But they have so many other cookie baking tools that are an absolute must in the kitchen during this time of year. I baked these cookies on the OXO Non-Stick Pro Cookie Sheet, which makes for super easy cleanup and beautifully caramelized edges. Their Silicone Cookie Spatula is the perfect size for easily maneuvering tons of holiday cookies. My recent favorite is their brand new Cooling Rack which is both beautiful and ultra functional. And if you haven’t tried out their nesting mixing bowls, they actually have a non-slip base so you can whisk and stir vigorously without the bowl sliding around everywhere. 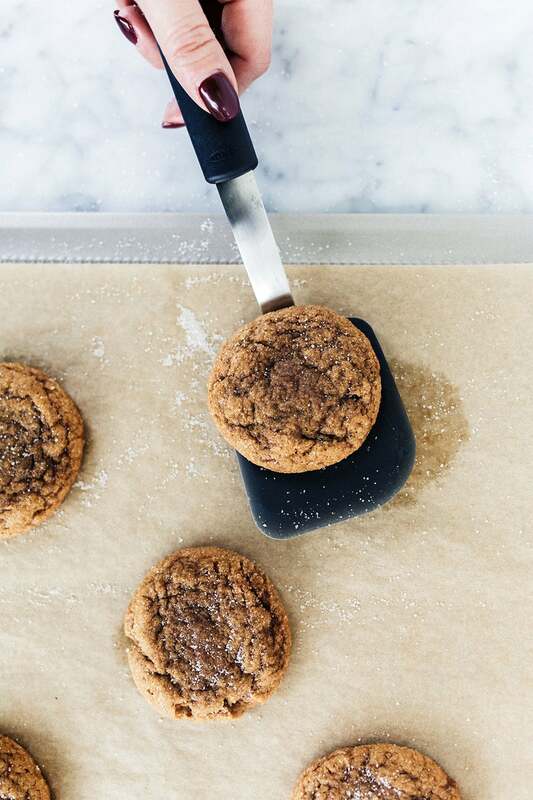 These kitchen goodies are just perfect for cookie baking. I’d definitely add a few to your holiday wish list, or put together a cute cookie baking gift basket for any bakers in your life! This is the best option for any drop cookie dough. Nothing beats a fresh cookie that’s still slightly warm from the oven. The best way to get that result is to bake the dough the same day you plan to serve it! Cookie dough can be stored in the fridge for up to 3 days. Let it sit at room temperature until it’s warm enough to scoop into balls. When refrigerating dough, it’s really important to store it in an airtight container like the OXO Smart Seal Glass Containers. If you don’t, the dough can easily dry out in the fridge environment. Balls of cookie dough are practically essential to any freezer during the month of December! This is the most convenient way to store cookie dough. Simply shape the dough into balls using an OXO Cookie Scoop, then place them on a parchment lined baking sheet and freeze until firm. Remove the frozen balls to an OXO glass food storage container and store in the freezer for up to 6 weeks. To bake from frozen, add about 2 minutes to the baking time. Or, allow the dough to come to a cool room temperature then bake normally. The colder the dough when it enters the oven, the thicker the cookie will be! 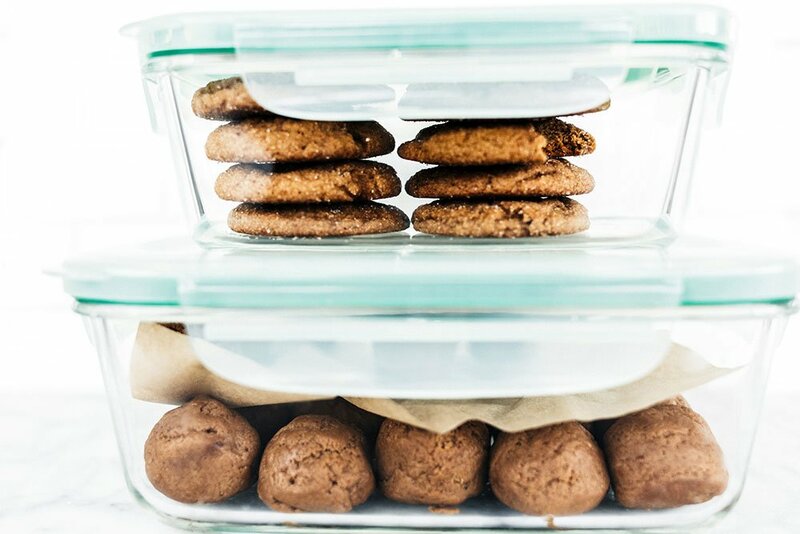 Cooled cookies can be stored in an airtight container at room temperature for about 5 days. I prefer the OXO Smart Seal Glass Containers. They protect the cookies from getting squashed and make for easy transportation to any holiday party. To keep the cookies extra soft, try adding an apple wedge or piece of bread to the container. To reheat and refresh the cookies, place them in a 350°F oven for about 3 minutes. Preheat the oven to 350°F. Line large baking sheets with silicone mats or parchment paper. In a large bowl, use an electric mixer to beat the butter, granulated sugar, and brown sugar until light and fluffy, 2 minutes. Add the molasses and egg and beat until combined. Add in the ginger, cinnamon, cloves, salt, cream of tarter, baking soda, and flour and beat until combined. Mix the 1/2 cup granulated sugar with the cinnamon in a shallow dish. 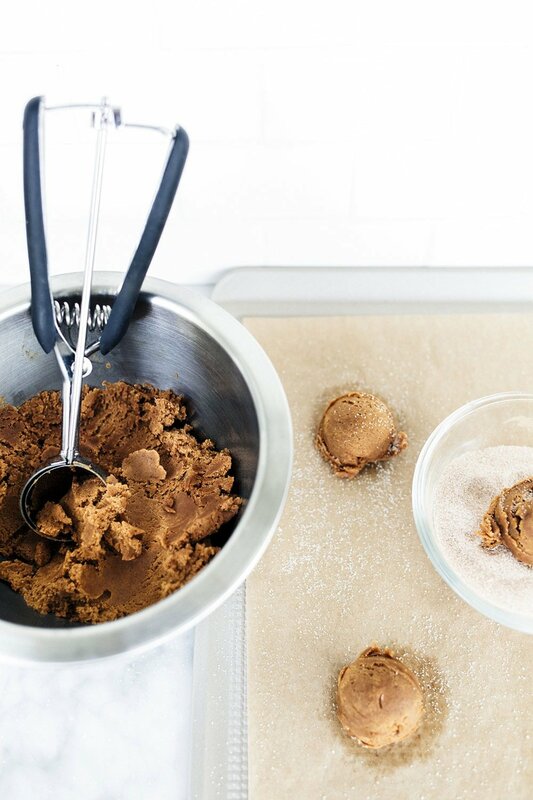 Using the OXO medium spring-loaded cookie scoop, shape the dough into 1 1/2 tablespoon balls. Roll in the cinnamon sugar before placing on the prepared baking sheets. Flatten slightly with the palm of your hand. Bake for 12 to 14 minutes, or until set. Let cool on the baking sheets for 5 minutes before removing to cooling racks to cool completely. Cookies can be stored in an airtight container at room temperature for up to 5 days. What an awesome idea! My kids love snickerdoodles and gingerbread! What a great combo. I made these last night and they’re INCREDIBLE. I’m not even usually a huge fan of spice/ginger cookies/breads/cakes/etc. Also, we may need a little more self control, because my fiance and I have almost finished them already. Lastly, if you want to keep promoting Oxo, I found this great thing called the Baker’s Dusting Wand. I dusted them all neatly and evenly with confectioner’s sugar and they’re festive and beautiful! You wouldn’t happen to have the recipe for when they were too crisp for your liking, would you? I love crispy flat cookies even though everyone else prefers soft. I would love to make these as you’ve posted for my family, but also make a small batch that are crispy for me to enjoy. Smells wonderful in my home. These are soft and delish. Will make again. Only made one recipe to try, made 22 regular size cookies. Will double next time. I love that your recipe combines two of my favorite cookies. However, I don’t have cream of tartar and your recipe calls for: 1 teaspoon cream of tarter and 1/4 teaspoon baking soda. I know baking powder can be substituted for the tartar and soda; but, I just don’t know the exact amount of baking powder to use. I was trying to do the math but trying to figure out how many tsp are in 1 tsp for the tartar is really throwing me off. I would appreciate any and all help for the specific amount of baking powder. Thank you.